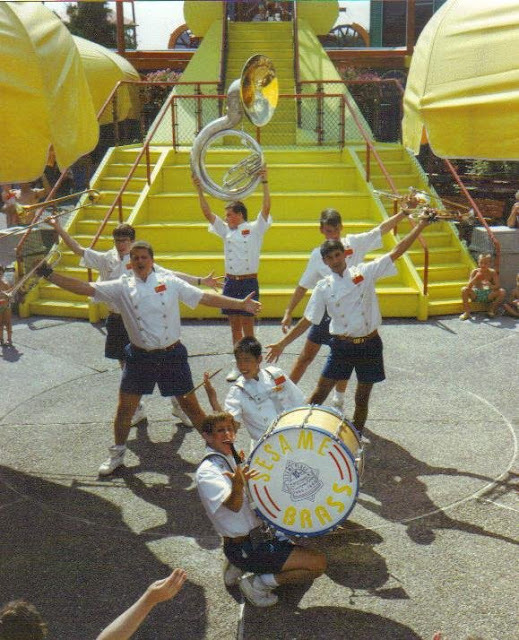 Over on the Sesame Place Facebook page there is an album of photos titled "Sesame Place 30 Great Years - Album 1". Sadly, the album has been up for a couple years and "Album 2" has yet to materialize. 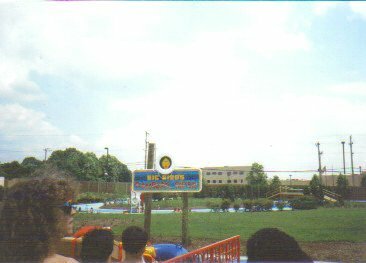 I wanted to show the images here so we can look at them a little bigger (they are very small on Facebook) and so they can be archived here in case the album ever gets deleted from the Sesame Place page. 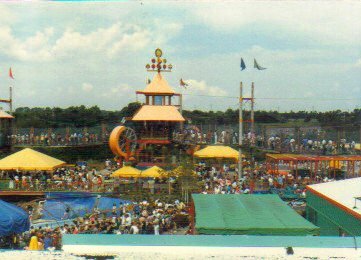 This attraction was called Herry's Hands Over Water. This shot shows Big Bird's Rambling River, but more interestingly shows how much empty space the park at this time. Look at all the grassy area! 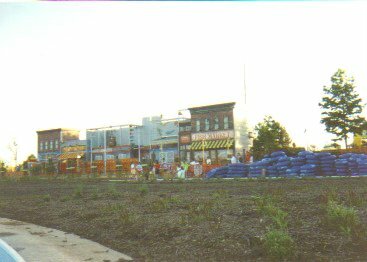 This shot shows the back of Sesame Neighborhood, likely from Big Bird's Rambling River! Notice the blue inner tubes stacked up on the right. Here is a nice shot of the Sesame Brass band in front of the entrance to Big Bird Bridge. Look closely at the mouth and you can see the bridge was still open at this point. This photo shows a large crane raising the centerpiece of the Nets 'N Climbs into place. Another nice construction picture of the Nets 'N Climbs. This looks like a reverse angle of the previous picture. 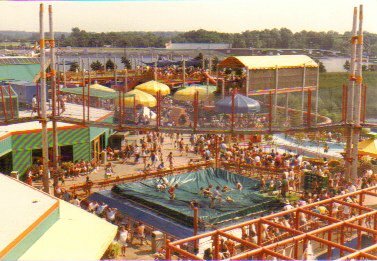 Here is a nice picture where you can see kids jumping on Rubber Duckie Pond and a few people walking across Big Bird Bridge. 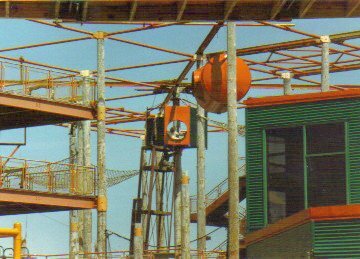 This tower was in the center of Big Bird Bridge and had the name Sesame Place Water Tower. It was a place where kids could pump water to the top of the tower and watch it flow down the water wheels. 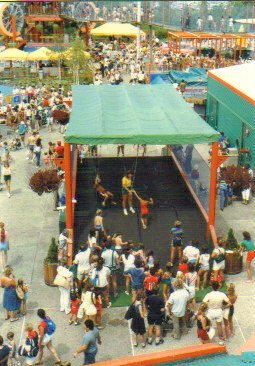 The green tarp in the foreground was Twiddlebug Hop, a rope swing attraction. 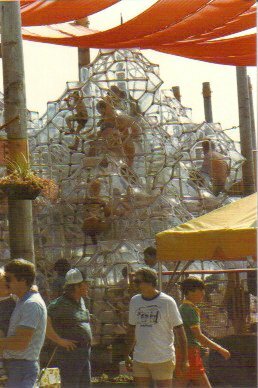 Here kids are seen climbing through a giant plastic maze of geodesic shapes. 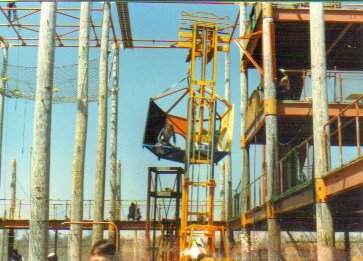 This attraction was called Crystal Climb. Notice the employee in the green and yellow polo shirt with red shorts. 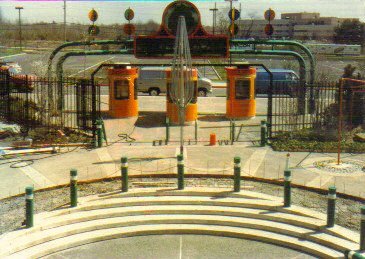 This is a great shot of the old entrance looking towards the parking lot. Today this would be facing the "fire station" facade of Sesame Neighborhood. 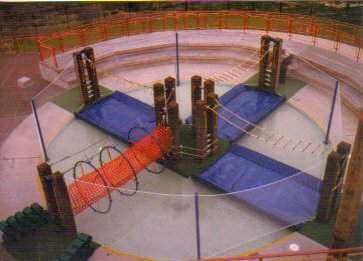 This is Twiddlebug Hop, an attraction where kids would swing on a rope over a series of bumps. Make sure and visit the Sesame Place Facebook page and click "like"!